* Planning principles shown here have achieved broad support throughout the Fort Point neighborhood. These principles have been presented clearly and consistently to the Boston Redevelopment Authority over the past decade by SAND, Fort Point residents, property owners and members of the Fort Point Community. As shown above, for nearly a decade the Fort Point community has advocated for a recreational field in the heart of the Fort Point neighborhood, enabling greenspace to also be used to highlight access to the Fort Point Channel. In 2004, four out of five teams of participants in the BRA's Fort Point Open Space Charrette came to the same conclusion. This outcome was also anticipated in BRA’s Public Realm Plan (1999), Municipal Harbor Plan (2001), and supported by the Boston Society of Architects Seaport Focus Team. Also shown (at top) are the mix of uses required for the creation of a successful, vibrant and densely populated urban neighborhood. Buildings should not be segregated into separate and single uses (i.e. office building, office building, condominium, office building) as anticipated in the BRA 100-Acres plan. Regarding the massing, height and density, the Fort Point community has long advocated for a plan which recognizes the importance of Fort Point's rich history and the character and scale of its historic buildings, with a few exceptions possible. The existing historic building heights are 75-100'. As an example of a successful project, the Channel Center preserved 14 out of 19 historic buildings, with no additions to height proposed on any of its historic properties. Comprised of over 15 buildings and over 1.5 million square feet, the Channel Center project included only 4 new buildings of heights greater than 75 feet. In contrast, the BRA's 100-Acre massing plan -- which was entirely drafted in private and presented to the community only in its final form with no modification possible -- suggests a total density of 6 million square feet and as-of-right minimum heights of 100, 150 and 200' feet, with more height possible through a parcel-by-parcel approval process (PDA Master Plan, to be drafted in months ahead). Greenspace provisions on tidelands properties are roughly the same as would be required under State Chapter 91 waterfront regulations -- the BRA 100-Acres plan does not enhance the public space on tidelands properties while it proposes valuable increases in height, density and changes to land use. 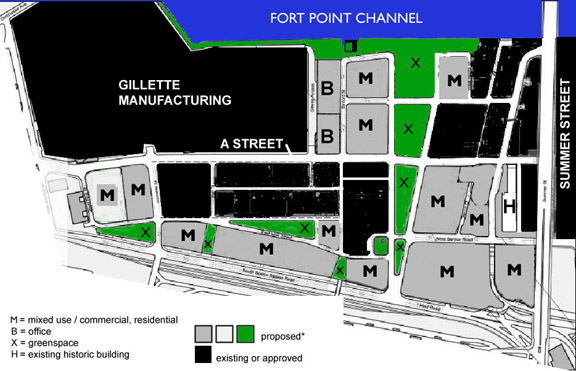 Click here to view a timeline of Fort Point greenspace planning. Click here to return to the SAND news page.